Moses had been gone for several days. Aaron scratched his beard and couldn’t help but worry about him. Maybe he’d gotten lost, he told himself for the millionth time. Maybe he’s tripped and fallen, or an animal came upon him and he needs our help. But no, no that can’t be. Moses has spent enough nights in the wilderness to know his way around, to take care of himself. Aaron knew that much. He glanced out his window, up the face of the mountain. The summit was hidden and cold, shrouded in a cloud so desolate and bitter it was easy to imagine things had finally gone sour. Moses had a tendency for talking back; he had a tendency to doubt and question. Did he go too far this time? “But Lord, I am…”Strike of lightning. A whirlwind. All the power and rage of the sea that had been parted, in a single moment crashing down on the man who dared to question Him who controlled it all. Aaron could hear his brother say it now, heard it as much as it broke Aaron’s heart to hear it. Maybe Moses really was gone. “Where is he?” They asked him in the morning. “Have you heard from him?” They asked at dinner, around the water circle and during their meetings. “What’s become of him?” They asked him the callousness of self-preservation delivering their words with a sting. What’s become of him and what’s to become of us? What has become of him, indeed. Every day, Aaron awoke and walked around camp, bearing not only the weight of potential grief but with it the weight of potential responsibility. If Moses was gone, that left…him. Him to answer questions, Him to lead the people, Him to appease the angry god who had taken his brother and left him. Him. Finally, after another day of agonizing grief, Aaron awoke and looked in the mirror. His brother was gone, for all intents and purposes Moses was not coming back. Aaron wept. He wept and when he was done he splashed water onto his face, and rubbed the red from his eyes. He took a deep breath and blew his nose. He talked into the mirror, listening to his voice, searching for any morsel of sadness, weakness or hesitancy within. He’d been talking for Moses for a while now, speaking the words of Moses and the words of God, but now he had to speak his own words. Moses was gone which meant God must be angry. Something had to be done. He stepped out of his tent. “Take off the rings of gold,” he said and people turned. They stopped from their chores and mothers stepped outside of their tents appealing “shh! shh!” to the crying infants in their hands. Aaron was speaking. We must listen, listen for hope. “Take all the gold rings,” he said, “the ones that are in the ears of your wives and sons and daughters and bring them too me.” Slowly but surely a pile of gold appeared at Aaron’s feet. Aaron nodded and more gold accumulated. Another man volunteered his skills as a sculptor, another as a carpenter. Aaron needed them all, he glanced up at the mountain, shrouded in mystery, darkness and fear. He needed them all. And throughout the day the gold continued to accumulate and they melted everything they had into one glob. Aaron thought of his time at the university, of his time studying other cultures, the tribes all around him. What could he do to appease an angry God? He was no priest, but he was earnest and he was a learned man. And so the story goes: they crafted a golden calf. From his experience, from his worldly wisdom, intuition and good intentions, Aaron crafted a golden calf to represent the God who had taken his brother from him. 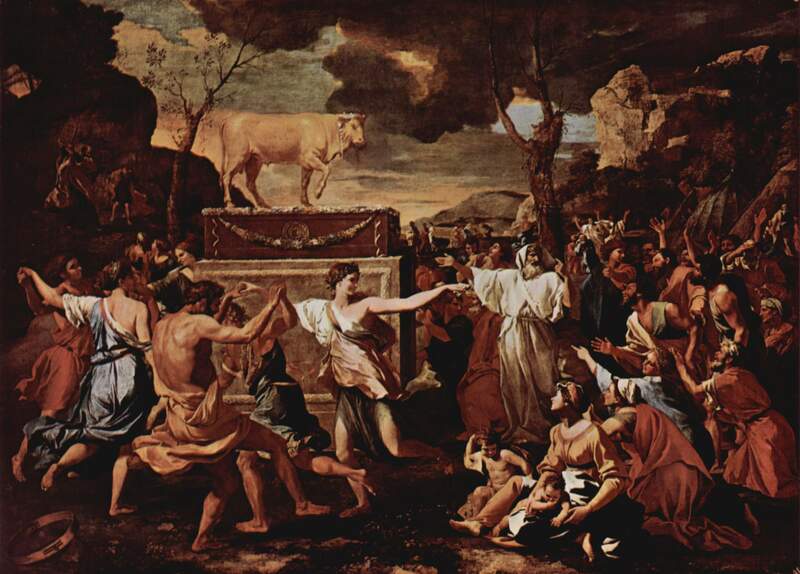 He made a golden calf unto the Lord, hoping, praying, muttering and worrying through all the night that this might possibly appease the anger of a powerful God, that whatever Moses might have done to prompt this anger might be appeased by his leading of the people before god as they knew him. And he called the calf “Pro-Life,” “Peace”, “Social Justice” and “Love”. He called the calf “God”, and “Jesus”, called the calf by a western name, called the calf by the declarations of what Aaron could say, staring out of his tent up onto the mountain top clouded in mystery. “God is…” he said, and built the calf to represent “God is…” staring up into the mystery of “I AM”. He named the calf “god”. And then Aaron declared there would be a feast, a potluck, and oh, was there ever a grand one. The finest calves were slaughtered, the most delicious casseroles were made, the ripest fruits gathered, and the favorite grandmother in the church baked her world famous key lime pie. There was singing of hymns and the youth group worship band gathered their instruments on the lawn and led the people in song after song. And there was dancing, swing dancing and smiles and people falling prostrate before their god. And there was sacrifice, a tithe bucket passed around time and time again, animal upon animal slaughtered, sign up sheets on clip boards for local ministries asking for an hour on Wednesday night to help care for the poor and burnt offerings sent up to god. Through his grief, Aaron led the Israelites to the hope of a religion that looks exactly what religion ought to look like, banners waving and propagandas staked into the lawn of the church in the center of town. He lead them to the God he knew, and told them it was God. Aaron sat in a chair and opened a can of soda. He took a deep breath, and all the hidden tears and grief and questions that welled up inside of him, for a moment, felt at peace as he looked out onto the people worshiping and happy, with a tangible god standing motionless before them. And then something shattered. Aaron jumped. It sounded like a window- perhaps one of the kids had thrown a baseball through? No, it was heavier than a window, stronger, more powerful. The music stopped and everyone looked. There, in the parking lot with the mountain looming in the background was Moses, with what looked like a shattered tombstone at his feet. Aaron started towards him, until he saw the betrayal, anger and rage on Moses face. We are Aaron. We are the people of Israel standing in front of our golden calves, our perceptions of God, dancing around and singing gleefully of the wonders of our intellect, our ability to craft an image of God when all hope was lost. This image did not come easy for us; we sacrificed sweat, tears, golden rings and days in the soup kitchens and seminary libraries to conceive our idea of God that we could bow down and worship. But we did it! We built our golden calf and now we set it up so we can look at it, and not at the mountain top standing behind it, shrouded in cloud, mystery, wonder, fear and the unknown. We are idolaters at heart, with every inch of our being we yearn for things to worship. “Love God!” we declare and we pay more homage to our reflection in the mirror or a piece of propaganda than we do the actual mystery of God. If I thought I had answers to my questions on God, Marilynne Robinson declares through one of her characters, I’d be a fool. God is unlimited, David James Duncan proclaims, but thought and language are limited. “Who is this that obscures my plans with words without knowledge?” Job records. Who am I? I am a well-meaning idolater, a pagan with the best intentions and narrowest of heart. An idolater nonetheless. And I quake like Job in the whirlwind. Ouch in a good way. breathe, the water we drink, as well as the earth we walk upon. In Conquest Mode, changed the neutral non-buff camp spawn time and energy to every 100 seconds (down from 180s). also all they will really want is people upset.